Music The Desert Pyramid Beckons! 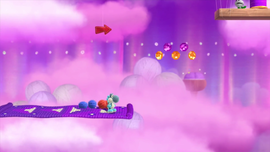 Flying-Carpet Cruise (parsed Flying Carpet Cruise in PAL versions) is the third level of World 5 in Yoshi's Woolly World. The level begins with a flying carpet that behaves mostly like a Switchboard. Yoshi will cross a Snoot and many Fly Guys before reaching an area with Piranha Plants. After crossing a few more Snoots, the first checkpoint appears, along with the outline of a carpet and a Fluffy Phantom. Afterwards, a few Hook Guys appear, along with many more Fluffy Phantoms blowing up carpets. This leads to the second checkpoint, along with a giant carpet. Along the way, Item Balloons will drop Shy Guys, Hook Guys, and rockets onto the carpet. Nipper Plants then appear, along with conveyors containing Piranha Plants. Afterwards, the goal roulette appears. Smiley Flower 1: In a hidden Winged Cloud within the area with the first few Piranha Plants. Smiley Flower 2: In an edible wall below the platform leading to the first checkpoint. Smiley Flower 3: Behind a Fluffy Phantom just before the first Hook Guy. Smiley Flower 4: Just below the platform just after the group of Hook Guys. Yoshi must take out the Hook Guy and Fluffy Phantom to the right, then eat the edible wall to collect the Smiley Flower. Smiley Flower 5: In a hidden Winged Cloud between the Nipper Plant area and the conveyor belts with Piranha Plants. Wonder Wool 1: In a Winged Cloud circled by the first two Fly Guys. Wonder Wool 2: In an area immediately after the first Smiley Flower, between a Fly Guy and two Piranha Plants. Wonder Wool 3: When reaching the area with many Hook Guys, Yoshi must use a carpet to enter a green warp pipe directly above. 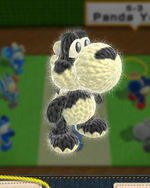 Inside the secret area, Yoshi must ground pound the carpet to approach the Wonder Wool. Wonder Wool 4: In plain sight, just after the first Nipper Plants. Wonder Wool 5: In a Present Box outline between the conveyors with Piranha Plants. Collecting all of the Wonder Wools knits Panda Yoshi back together. This page was last edited on March 20, 2019, at 01:18.